Intervals are, in my opinion, the most difficult of the basic theoretic element to master. This is because they are so tiny and atomic, and they are divorced from the larger musical contexts you may be familiar with. However, now that you've become comfortable with your scales and triads I think you are ready to get down to this level of detail. I have a printout called everything you never wanted to know about intervals. For your first lesson, I'd recommend reading through page 6 (on the "enharmonic error"), and then practicing your smaller intervals (those a perfect fifth or smaller). Here's a worksheet for written practice. 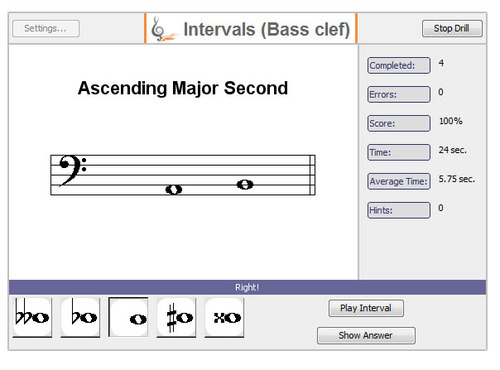 Robert Whelan has a quizzer that can help you build intervals in treble clef or bass. As usual I'd recommend tinkering with the settings to get the perfect batch of "small intervals." I'd work on gradually turning on the flats and the sharps at the top of the page (which will ask you to build intervals from Eb or F# instead of plain old A, B, C). And towards the bottom I'd turn off everything larger than a fifth, so you can focus on the "small" intervals. The default setting is to spell them all ascending, but I'd eventually turn on descending intervals as well. My rudiments quizzer also drills intervals, and its initial screen allows you to select "small", "large", or "tricky" intervals.